What was repeatedly uttered as threat during periods of frustration, has finally occurred. The noise, clutter, trash, traffic, congestion, and distracting consumption of urban living has been shucked for a more rural lifestyle. We bought the Old Gilmer Place. It's not really that old. It's not old at all. The house was built, by a guy named Gilmer, in 2005. But, in keeping with rural ways, it seems appropriate to introduce oneself as the new guy in town and add, "Yeah, we bought the old Gilmer place,"...because that is the way they say it in the country. 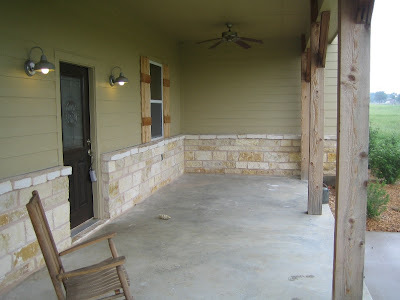 It is a simple, modest house sitting on about 3 acres in rural Denton County. It is a place that seems to have a lot of potential...which is a positive spin on the fact that I'm already way behind on my chores. Being born and raised an ignorant city-boy, I've got a feeling that future posts here might be amusing to the rest of you. Stay tuned for descriptions of lessons I'll be learning...and you can count on this...the hard way. Nice to hear from you. We see the house as a blessing from God and pray that He will use it and us for His purposes. We'd love for you guys to come and stay awhile.